THE LINKEX™ PORTABLE FLUORESCENT LEADLAMP EMERGENCY HAS A BUILT-IN BACK-UP BATTERY POWER SUPPLY TO LIGHT THE LAMP IN THE EVENT OF A POWER FAILURE AND IS IDEAL FOR EXIT ROUTE LIGHTING ALLOWING HAZARDOUS AREA WORKERS TO FIND THEIR WAY TO SAFE AREAS AND EMERGENCY MEETING POINTS. 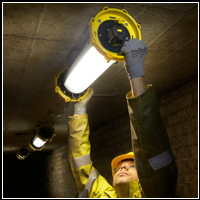 The Emergency Leadlamps are ATEX Directive and IECEx Certified for safe use in Zone 1 (Cat 2) IIC potentially explosive gas, vapour, mist and dust atmospheres, where a T3 temperature class permits and have twin side by side forward facing 36W energy efficient fluorescent lamps, delivering 5800 lumens output, available in voltages of 110V to 130V. Upon power failure, the Emergency Leadlamp’s battery back-up supply initiates and powers one fluorescent tube immediately at a reduced power level, giving approx. three hours light output. The leadlamp should be charged/discharged 3 times upon commissioning to ensure the battery is cycled to peak capacity, charging time shall be min 24hrs. If powered for a short time the battery duration will be proportionally reduced. 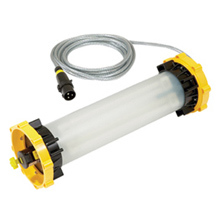 The Emergency Leadlamp is supplied with an ATX plug and socket to allow the units to be instantly linked together, allowing for quick and easy installation over a large area and can be used in a chain, in series or intermittently, with Wolf’s range of LinkEx™ Luminaires and Floodlites. Unistrut compatible mounting points on the lamps provide a flexible and low cost installation solution allowing them to be quickly and easily fixed in position on pipes, scaffold or a ferrous backdrop with magnetic fixings. In addition, the leadlamps are easy to maintain and re-lamping is simple using standard compact fluorescent lamps and can be done by a competent electrical engineer. All products supplied with 4mm2 SY Cable and ATX plugs/sockets as standard. CEAG and Stahl Plugs and Sockets available on request. 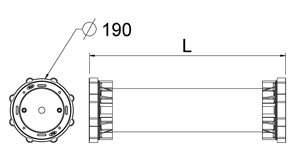 Ships braided cable for offshore applications to BS6883 available on request. 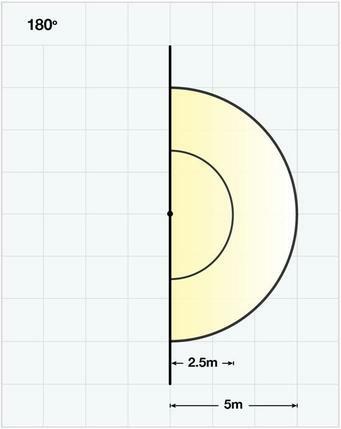 All products supplied with fluorescent lamps fitted as standard. The Emergency Leadlamp will come on every time the supply is removed.